HomeBoard GamesChildren And FamilycataGarbage Day! There\'s an epic battle of wits being slyly waged among you and your roommates. No one speaks of it, or even acknowledges its existence, but when it comes to taking out the garbage, it\'s all about the art of the dodge. In the pursuit of avoidance, each dexterously stacked banana peel represents a small victory. That candy wrapper hidden in the deep recesses of your room is a silent success. But the greenish milk carton you secretly stashed under your roommate\'s bed, that was a stroke of genius! That is, until you get caught making a mess while everyone else pretends they would never be so childish — as to get caught. Be careful and be cunning because only the champion can gloat in a hammock while everyone else lugs out the trash on garbage day. 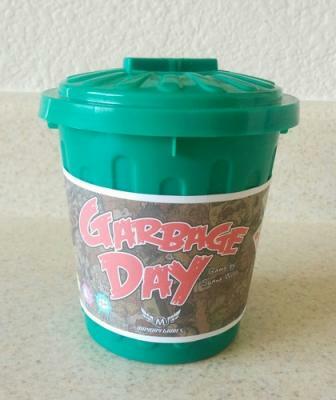 In Garbage Day, players take turns stacking garbage cards one at a time onto the overflowing garbage can, or stashing garbage cards in their rooms. But once a player\'s room gets too full, they must clean it by stacking all the cards from that room on top of the garbage can, very carefully, one by one. If garbage cards fall off the garbage can during your turn, place them in your overflow pile. If your overflow pile gets too big, you\'re eliminated from the game. If all other players have been eliminated, you win!